There’s surely something strange about depictions of physical intimacy onstage. We understand that the stage directions, like the lines the actors speak, are all scripted. But two people kissing onstage are still kissing. Sarah Ruhl’s comedy “Stage Kiss” doesn’t dwell too deeply on such metaphysics. Ruhl is a highly interesting playwright and two-time Pulitzer Prize finalist, but this 2011 entry is not a major work. 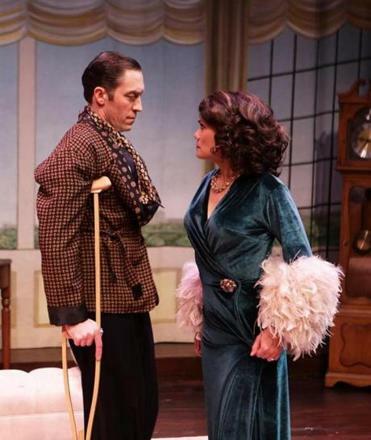 Yet as seen in a crisp and attractive production at Lyric Stage Company of Boston, it makes for an agreeable romp with ample laughs and just enough winks toward something deeper to suggest to attentive audience members that perhaps they’re onto something. Ruhl gives us two central characters, identified only as She (Celeste Oliva) and He (Alexander Platt), ex-lovers reunited in the cast of a remount of a 1930s Broadway flop. Oliva motors “Stage Kiss” from the outset, when we see her nervously auditioning for the amusingly ineffectual director played with a light comic touch by Lyric mainstay Will McGarrahan. This actor has the gift of making it look easy, but his comic timing here is expert. Through the rehearsal process of this play-within-a-play and its opening night, we track the exchange between the hokey melodrama’s depiction of an affair and the evolution of She and He’s relationship. The structure is inverted in the second act, when offstage life gives way to the performance of a different play. We get repeated reminders that the line between an actor doing her job and a person living in the moment is more permeable than is comfortably acknowledged — such as when botched stage business leads to a genuinely broken foot or sprained neck. Director Courtney O’Connor keeps the clever storytelling twists lucid, making sure we follow the transitions from play to play-within-a-play, even when they occur in the same scene and on the same set. O’Connor’s deftest move, though, is facilitating a pair of ever-more-impressive central performances. Oliva and Platt are provided here a showcase of their craft. The piece could easily lie inert if not for these actors’ firecracker chemistry. In scenes set “onstage” and off, the two model the full emotional journey of a testy romance, from post-coital bliss to the bitter re-litigation of ancient disputes to an awkward post-breakup meeting. “Stage Kiss” is forever reminding us of the essential artifice of performance (starting with the protagonists’ names), but Oliva and Pratt keep things anchored by believably playing the reality underlying the gags. Even when their motivations are obscured by costumes and heavy accents, we observe the evolution of these characters. Another chief asset is Michael Hisamoto as Kevin, an all-purpose understudy. Kevin’s presence in various roles becomes a running joke — particularly when a scene calls for his very awkward kissing skills. (Kevin is gay, and the trepidation with which he approaches his intimate moments with She is hilarious.) Craig Mathers, Theresa Nguyen, and Gillian Mackay-Smith also do admirable double duty in roles that work as mirror images. The playwright doesn’t quite stick the landing, as things take a turn for the sentimental and we’re suddenly meant to be invested in the mending of an offstage relationship we’ve seen little of. The play’s concluding beats feel very familiar, reminding us we’ve really seen all of this before, in other backstage tales told in the theater and on film. But in one bravura comic sequence involving the director’s intervention in an onstage kiss, we get a reminder that even the most personal of gestures may be merely artifice — whatever one might be pretending.